Udon is as simple as it is versatile, which set the stage for the identity of this minimalistic designed restaurant. If you follow me on Instagram, you know my love and exploration through Japanese cuisine is no secret. So when this project kicked off with a menu tasting, I whole-heartedly prepped with a 24-hour fast. Mild flavoured and magically healthy, this 3-ingredient slightly chewy strand, stands tall in the noodle world and I was ready to experience it in all its dishes. 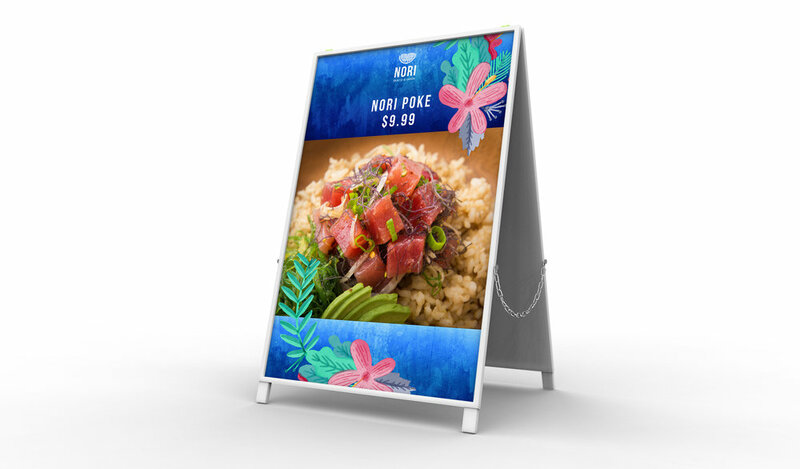 Nori Bento & Udon, a new restaurant on UBC campus and the vision of Janice and James, needed a complete brand package including identity, signage, menu and sandwich board design. My goal was to create a look that was strong yet fluid, minimalistic yet bold and as easily digestible as an udon. The reverse logo in a tall, narrow bold font set on a rich and bright blue etched watercolour background fulfilled the brand requirements as much as the dishes filled my belly. The watercolour texture is used selectively throughout the restaurant as a wall treatment and transitions seamlessly into the various design applications. Janice and James of Nori Bento & Udon and I have a history. In the past Rokotype was commissioned for identity development of their other restaurant ventures, Umi Sushi and Living Foods.